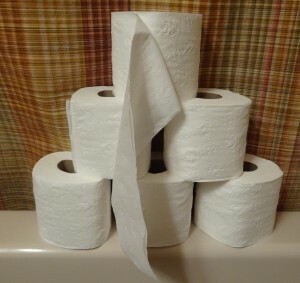 Flush Away… it’s National Toilet Paper Day! While there’s an abundance of fun trivia related to toilet paper (including that it takes about 384 trees to make all the toilet paper that one man uses within his lifetime), there’s also more serious toilet paper issues at play. For example, what’s the most energy efficient method to flush away all the toilet paper we use in a year (estimated at 20,805 sheets)? The experts at Mansfield Plumbing recommend Summit toilets featuring the MagnaFlush system. “Summit toilet lines with MagnaFlush capabilities that can dispose of 1,000 grams MaP — which is the equivalent of 21 ounces — so even excessive use of toilet paper and waste can be easily flushed away in these toilets,” says Adriana Miller, product manager at Mansfield Plumbing. “A MaP rating represents the number of grams of solid waste and toilet paper that a particular toilet can flush and remove completely from the toilet in a single flush. “1,000 grams is the highest rating for a MaP score. MagnaFlush is the Cadillac of toilet flushing systems. It’s designed for high efficiency/high performance toilets with a pilot operated fill valve, large three-inch flush valve and a 2-inch or greater sized trapway. Miller points out that MagnaFlush technology does more than just impressively help remove large quantities of waste quickly from a toilet bowl. “The water efficiency combined with MagnaFlush technology in the Summit 1.28 and Summit Dual Flush toilets qualify these units as WaterSense® approved products,” says Miller. Finally, the success of MagnaFlush technology doesn’t matter if you’re a toilet paper folder or a crumbler (and, according to a survey of bathroom habits from MaP Testing, almost 50 percent more people fold their toilet paper rather than crumble it). Made in the USA, the MagnaFlush systems in select Summit toilets are ready to handle the load … no matter how much toilet paper you may choose to flush away! * Information provided by Toilet Paper Encyclopedia and the Toilet Paper History website.